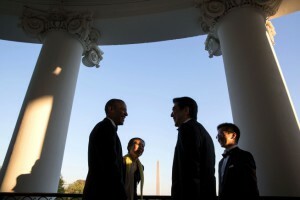 President Obama and Prime Minister Abe speak on a White House terrace during an April state visit. Back on July 31, WikiLeaks released a set of NSA targets and intercepts involving Japan. Along with business targets and discussions of trade agreements, the intercepts included one that described results of a meeting at Prime Minister Shinzo Abe’s official residence (the intercept dates to Abe’s first term as Prime Minister in 2007). In other words, amid a contrite conversation about whether the US was still spying on top ministers describing what they had discussed about climate change with Abe in his personal residence, Obama and Abe reiterated their plans to cooperate on climate change. Even as Abe said the US had better not be spying on top ministers discussing trade deals, he and Obama agreed they would continue to work on the Trans Pacific Partnership. Or, to put it differently, Obama and Abe made a big show of pretending that the NSA doesn’t spy on Japanese ministers about their trade deal stances so that Abe would appear to be negotiating the TPP with Japan’s best interests at heart.